Plan The Unplanned in association with IWasThere brings you one of the finest Himalayan Winter treks out there suitable for those looking to attempt their first Himalayan trek as well as the more experienced trekkers looking for a quick Himalayan getaway. If you have been longing for a high altitude Himalayan trek through the snowfields and gaze at the mighty peaks kissing the sky, then this surely is the thing for you! There are very few treks in the Indian Himalayas which boasts of being an easy summit trek. Summit climbs are generally arduous and need technical mountaineering skills as well as require a lot of preparation. 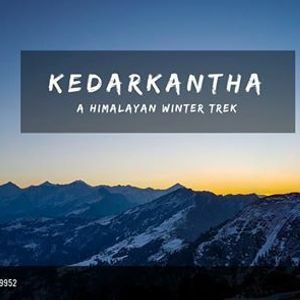 But Kedarkantha, definitely, is one of those rare summit treks which can be done by beginners and even during peak winters. 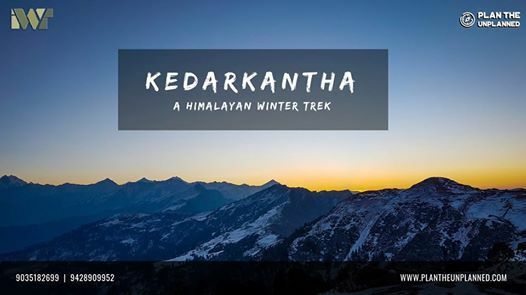 Very few treks can be done during the winters and this is what makes the Kedarkantha trek very enticing. The whole landscape is magical with snow falling over numerous pine trees which makes Kedarkantha one of the most sought after treks in the Indian Himalayas. Trekkers can enjoy the Snowy campsites and also fresh snowfall during the winters. And the feeling of summiting a peak is unparalleled which also makes it very adventurous. 1.Camping in tents on all the days during the trek on twin/triple sharing basis. 1. All meals since arrival at Sankri till the dinner on Day 5. 2. During the trek – Breakfast, Lunch, Evening Snacks and Dinner will be provided. Tea will be a part of breakfast and evening snacks. 3. The food will be vegetarian and eggs may be provided. 4. Personal expenses like Soft drinks, bottled water, beverages, etc. not included. 1. Transport: Non AC coach from Dehradun to Sankri on Day 1 and back on Day 6. 1. Food during the transit from Dehradun to Sankri and back is not part of the itinerary to give our trekkers an opportunity to indulge in some local cuisine. Feel free to stop at many of the Himalayan Dhabas on Day 1 and Day 6. 2. Any charges for carrying still/video cameras etc. 3.Personal expenses like tips, telephone calls, laundry, etc. 4.Trekking equipment like trekking bag, shoe, trekking pole etc. 5 Any costs arising out of unforeseen circumstances like landslides, roadblocks, bad weather, etc. 1We expect our trekkers to carry their own bag, however, if someone wishes to load their trek bag on a mule or take the assistance of a porter and carry only the day backpack, an additional charge of Rs 1200 for the entire duration of the trek is applicable. Part offloading of the backpack is not allowed. One bag per trekker is accepted for offloading and the bag can not weigh more than 10 Kgs. 1. We do not accept trolleys, suitcases, duffle bags or travel bags for offloading and only trek bags are accepted. Trekkers need to deposit a medical declaration form duly signed by a Doctor before the start of the trek. Trekkers failing to get the medical form will not be allowed on the trek. 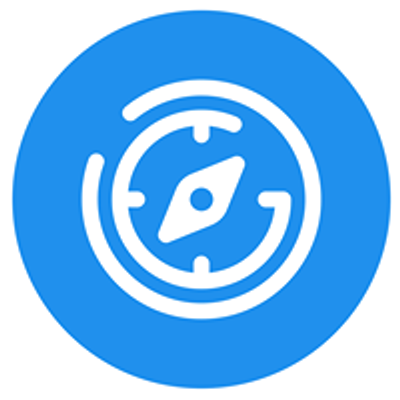 One can easily reach Dehradun from Delhi by bus or train, that run overnight and offer comfortable travel experience. The distance from Delhi to Dehradun is approx 280 km, which can be covered in 5 to 6 hours. You can check out the IRCTC Website to know more about the trains or RedBus to find out the best options! Please note that you need to reach Dehradun before 6 AM on Day 1, or you can reach the previous night, as per convenience. It would be more convenient to reach a day prior.